After Senate Democrats cut a deal with Republicans to allow confirmation votes on a handful of President Obama’s appointees, it appears likely that the Senate is returning to “filibuster city,” as Burgess Everett of Politico referred to it in an article earlier this week. “There’s already a queue forming of new Obama nominees, and Republicans aren’t about to lay down and let this group go through,” Everett wrote. That the battle lines in the filibuster wars are re-forming after a brief respite is nothing new. Ultimately, both sides have refused to significantly limit the filibuster despite having opportunities to do so in the past decade — the “Gang of 14” deal preserved the filibuster for judicial nominations in 2005 when Republicans threatened to go “nuclear” on Democratic obstruction of President Bush’s nominees, and this most recent deal on Obama’s executive branch appointees preserved the filibuster on non-judicial nominations after the Democrats threatened a nuclear strike of their own in response to Republican obstruction. So the Senate minority’s weapon against the majority — the filibuster, with its 60-vote barrier to action — remains intact. A so-called nuclear option would involve a bare majority of the Senate changing the filibuster rules to restrict the use of the parliamentary technique. We’ll let others argue as to whether the potential filibustering of nearly everything in the U.S. Senate is good or bad for national governance. But what we can point out is that without one side refusing to blink on significantly weakening the filibuster, such battles seem bound to continue. That’s because the balance of power in the Senate is likely — for at least the next three cycles, and quite possibly beyond — to prevent either side from controlling the 60 (out of 100) votes they need to really rule the Senate. With the use of the filibuster vastly increasing, and a reluctance by either side to “go nuclear” and limit its power (thus opening the door for them to be stampeded when the other side wins the majority), the only way for the Senate majority to exercise real control over the upper chamber is to control 60 reliable votes. That’s been a rarity in recent years for either side, and the natural rhythms of Senate elections — where only a third of the body is up for election every two years — combined with the diverse Senate battlegrounds of the next three cycles are conspiring to suggest that the Senate majorities after the 2014, 2016 and 2018 elections appear likelier to be closer to the Senate break-even point of 50 rather than the filibuster-busting 60. First, a little history: Aside from a brief, roughly half-year period between the seating of Sen. Al Franken (D-MN) after a disputed election in the summer of 2009 and the election of Sen. Scott Brown (R-MA) in early 2010, neither party has held 60 senate seats at any point since the 95th Congress (1977-78), when the Democrats controlled 62 seats. 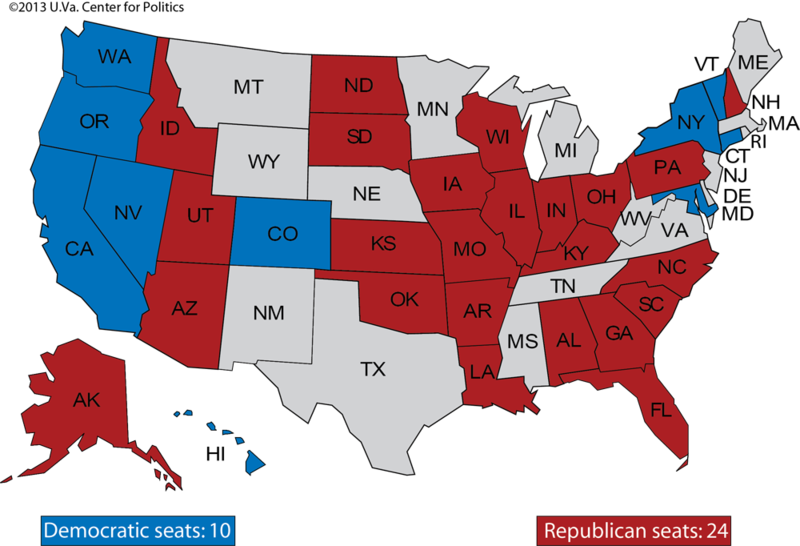 (The Republicans have never held 60+ Senate seats since the advent of popular U.S. Senate elections in 1913). 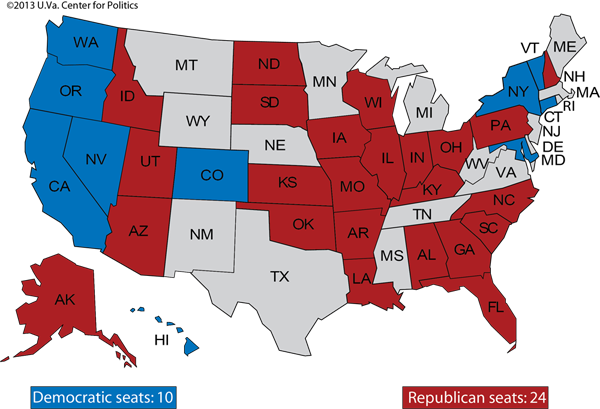 We have already analyzed the 2014 Senate map in depth — our most recent look is here — but, suffice it to say, Republicans are in pretty good position to make gains next year. 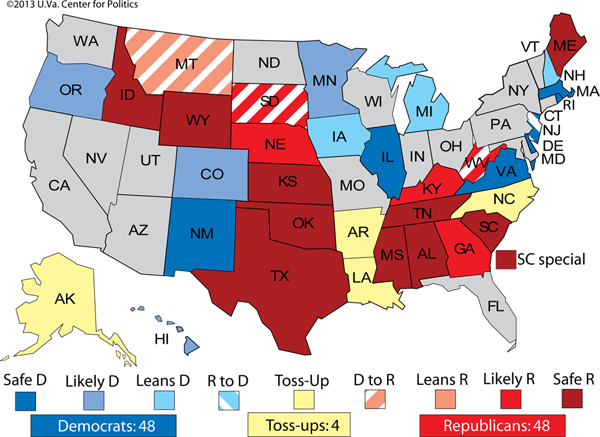 Our current ratings, shown in Map 2, favor the Republicans to pick up three Democratic seats in Montana, South Dakota and West Virginia, and they also give the GOP roughly even odds to win four other Democratic-held seats. For the purposes of this article — these are not official predictions by any means — let’s just split the difference here and give two of the four toss-ups to the Republicans, and the other two to the Democrats. Assuming no other changes, that would produce a 50-50 Senate. Vice President Joe Biden (D) would break ties, which would allow Senate Majority Leader Harry Reid (D-NV) to retain his position by the skin of his teeth. Democrats should have great opportunities to mount credible challenges to Republican incumbents in traditionally Democratic presidential states like Illinois, Pennsylvania and Wisconsin. Meanwhile, Republicans will probably take shots at Reid in Nevada (provided he doesn’t retire) and at Sen. Michael Bennet (D-CO), a narrow 2010 winner, but these were seats that eluded their grasp in optimal 2010 conditions. In other words, Democrats are set up for a decent year in 2016. Let’s say they pick up a modest two seats. 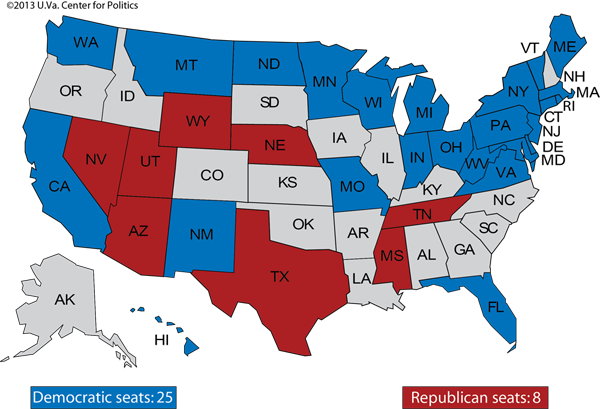 Assuming the 50-50 outcome from 2014, that makes the Senate 52-48 Democratic going into the first term of Obama’s successor. Heading into the 2018 midterms, the pendulum — on paper — hypothetically swings back to the Republicans, thanks to their several missed opportunities six years earlier in 2012. 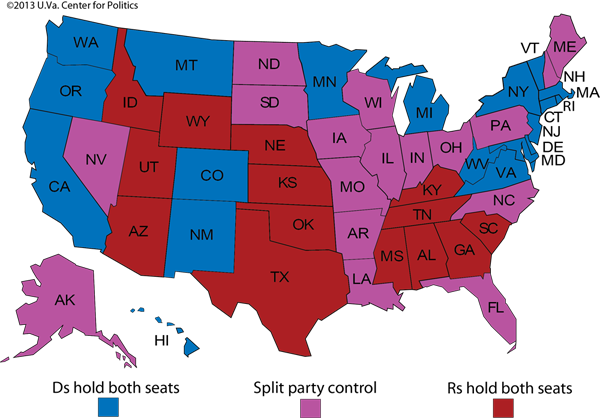 On this map, Democrats can target only one Republican senator in an Obama 2012 state — Sen. Dean Heller (R-NV) — while Republicans can go after Romney-state Democrats in Indiana, Missouri, Montana, North Dakota and West Virginia. Of course, the occupant of the White House will matter greatly in these elections; generally speaking, the president’s party loses House and Senate seats in midterm elections. 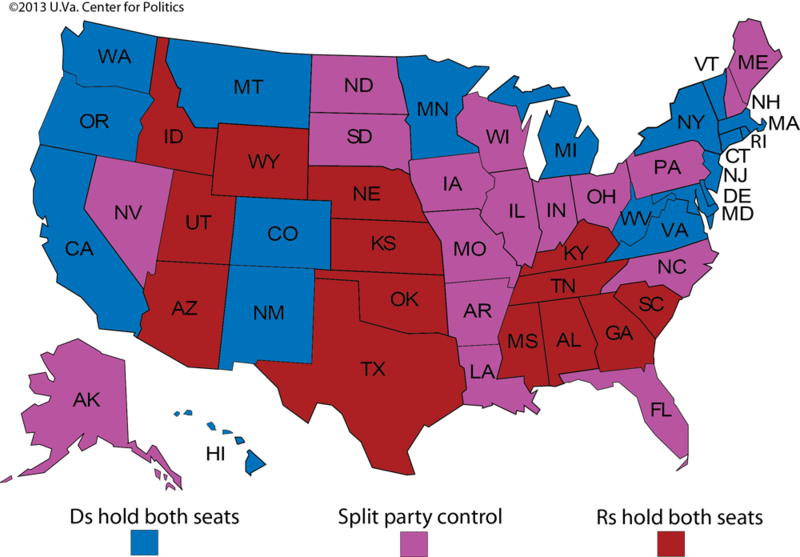 So while it would be distasteful for Red State Democrats like Sens. Joe Donnelly (IN) and Claire McCaskill (MO) to openly root for the Republican presidential nominee, there’s a good possibility that they’d be more secure with a Republican in the White House. Here’s a plausible outcome: Democrats beat Heller in Nevada, but Republicans knock off three of the Romney-state Democrats. And with that, it’s back to 50-50 in our imaginary Senate, with the vice president breaking ties, and neither side anywhere close to a true, 60-seat Senate majority. Obviously, this hypothetical chain of events could be upended by any number of factors, the most important of which is probably the 2016 presidential election. And what if there’s a major war, or what if there’s a strong uptick (or collapse) in the economy? What if, as my fifth-grade teacher liked say in response to interminable “what if” questions, “the world hung by a string, and the string broke?” There are plenty of unknowable things here as one plots out the future course of the Senate. 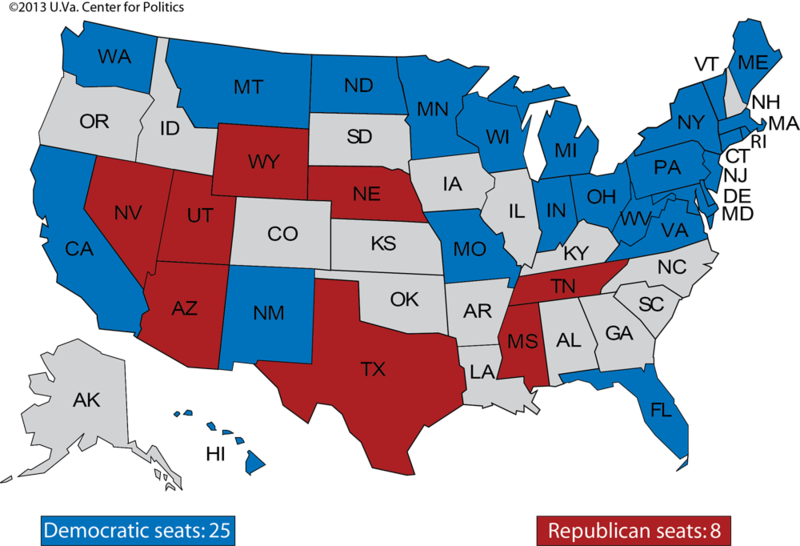 However, there are three things we do know: The Democrats are overextended on the 2014 map, which probably means the Republicans should, at the very least, make a dent in the Democratic Senate majority next year. Two years later, the Republicans will be defending a map on which they are overextended, which could help the Democrats make up for some of their possible 2014 losses. And then the Democrats are overextended again in 2018. All of which suggests that 60-vote Senate majorities are going to be elusive for either party, and future Senate majority leaders, be they Democrats or Republicans, are going to be continually tempted by some form of the “nuclear option” in limiting the filibuster. Given its rapidly increasing use, future Senate majorities — maybe even as soon as this one — might decide they have little choice but to reach for the button. Thanks to Crystal Ball reader Lance E. Schulz of Greensboro, NC, for recommending the idea for this article.